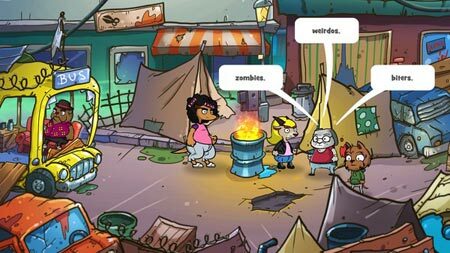 Scheming Through The Zombie Apocalypse: The Beginning is a story-driven zombies adventure game developed by Entertainment Forge. Your objective is to Join Hank and Larry as they use their knowledge of influence and persuasion to make their way through the zombies apocalypse. With a mixture of dark comedy and the use of real-life influence tactics, this story-driven game puts you behind the wheel of the characters’ choices. Guide your scavenger in high-risk situations, survive without having to actually work too hard. If you get stuck in the game, check out the video walkthrough and gameplay for the game. This entry was posted in PC Games, Walkthrough and tagged Scheming Through The Zombie Apocalypse: The Beginning Cheats, Scheming Through The Zombie Apocalypse: The Beginning Game, Scheming Through The Zombie Apocalypse: The Beginning Gameplay, Scheming Through The Zombie Apocalypse: The Beginning Guide, Scheming Through The Zombie Apocalypse: The Beginning Hints, Scheming Through The Zombie Apocalypse: The Beginning Review, Scheming Through The Zombie Apocalypse: The Beginning Solutions, Scheming Through The Zombie Apocalypse: The Beginning Strategy, Scheming Through The Zombie Apocalypse: The Beginning Tips, Scheming Through The Zombie Apocalypse: The Beginning Walkthrough by Marvin. Bookmark the permalink.